"A New Vision for Dropout Prevention"
This conference, to be held in beautiful Palm Springs, CA, is built around several themes including new models for CTE/workforce development, a new focus on arts/media/entertainment career paths, and a new approach for students and families who have experienced or are experiencing trauma. This third area of focus will also address strategies for supporting migrant and undocumented students. A dozen student-led sessions will take place on Monday afternoon. Keynoters and entertainment throughout the event will be informative and inspiring. NDPC/N’s Network conference is held in a different region of the country each year and is its largest and most attended conference each year. Please join us in Palm Springs in October for this exciting event so that you can learn from others in the fields of high school dropout prevention, intervention, and recovery. Click these links for registration and hotel reservations. Visit http://dropoutprevention.org/conferences/2017-national-dropout-prevention-network-conference/ for more information. What Is a National Dropout Prevention Center Program Assessment and Review (PAR)? Are high school completion rates in your school system satisfactory? Are you satisfied with the parental/community participation at your school? What about school safety and climate? Do you have a success plan for low-performing students? Do your classroom strategies address the social, emotional, and academic needs of low-performing and struggling students? Do you have a research-based process in place to guide your school improvement projects? Are appropriate alternative learning options available for students and does everyone know about them? Do you have effective strategies in place to provide options and support for struggling students as well as an environment for success of such strategies? Do your teachers and staff feel inspired, supported, and enabled to succeed? These questions and more are explored through NDPC/N’s multi-step Program Assessment and Review (PAR) process and in a more focused way through our targeted T-PAR process. Email us (ndpc@clemson.edu) or call (864-656-2599) for more information about how feedback, data, and NDPC/N suggestions via a PAR or T-PAR can help your school or school system. Join presenters Montina Romero, Lisa Zimprich, Moses Cho, and Matt Sanchez, from Fountain-Fort Carson School District 8 and the Fountain Police Department, both located in Colorado, as they discuss their pioneering and proactive model partnership that focuses on the whole child and the whole community in an effort to increase school safety. A focal point of the partnership is the number of School Resource Officers (SROs)–with approximately one SRO to every 1,000 students. To increase their effectiveness, SROs respond directly to an anonymous state reporting system, Safe2Tell, 24 hours a day and communicate on a daily basis with building and district administrators. At the conclusion of the webcast, participants will be able to identify components of an effective partnership between a school district and local law enforcement. They will also identify and understand the components of a thorough threat and suicide assessment process that builds community and improves school safety. Solutions webcasts are always offered to you free of cost, and no registration is required. Tune in the second Tuesday of each month from 3:30–4:30 PM ET for new Solutions to the Dropout Crisis, sponsored by K12 Inc. and FuelEducation. an overview course that touches on all 15 strategies in one course. Visit http://dropoutprevention.org/15-effective-strategies-online-courses/ for more information, including FAQs, or link to the NDPC/N store at www.dropoutprevention.org/shop to register for one or more of the 15 Effective Strategies for Dropout Prevention online courses. Thanks to DeeperDive Learning, Inc., (www.deeperdivelearning.com) for helping us design, develop, and offer these online professional development courses. Also new from NDPC/N are several resources and tools to help rural schools and school districts improve graduation rates: The Rural Principal’s Guide To Dropout Prevention; Recovery and Reengagement Initiatives in Rural Contexts; A Guide for Rural High School Graduation Coach Implementation; and two versions of a PowerPoint, The Local School Board’s Role in Dropout Prevention (standard screen size and widescreen size). These resources are free to view and/or download from the Rural Resources section of our website at www.dropoutprevention.org/rural-dropout-prevention-resources/. Each of these resources or tools can also be supplemented by other NDPC/N resources and assistance from NDPC/N staff, including presentations, workshops, program assessments, additional customized resources, professional development or technical assistance, and grant assistance and collaboration. Contact NDPC/N at ndpc@clemson.edu for additional information or assistance. On July 10, the U.S. Department of Education released two issue briefs on strategies that high schools may use to help at-risk students stay in school and graduate. The briefs, based on a national survey of high school principals, provide descriptive information about the prevalence and characteristics of key dropout prevention strategies for students who might need extra support. The two briefs focus on high schools that offer two types of services: (1) case management to students through a social worker or school professional who advises students and connects them to services that can address their academic and nonacademic needs; and (2) social services that can address an immediate student need outside of the classroom, such as health care, mental health care, and assistance with transportation, shelter, or clothing. A webpage from Education World links to more than 80 articles on various aspects of school climate, including but not limited to tips for building positive school climate, information on laws related to bullying, assessments for school climate and teachers’ discipline styles, making new students feel welcome, tips and cautions regarding using popular media resources, tips for positive parent-teacher interactions, and ways to incorporate flexibility without losing effectiveness. The University of Illinois Extension’s “Family Works” webpages offer resources for families. For example, on the page “Families’ Responsibilities to Their Schools,” there is a great overview of why school success is a joint effort between schools and families. Then the page provides a list of family responsibilities that would be useful, if not critical, for good family/school engagement and teamwork. In 2016, Edutopia published a series of articles based on the book, Turning High-Poverty Schools Into High-Performing Schools (Parrett and Budge, 2012 ASCD). One of the Edutopia articles, “How Can High-Poverty Schools Engage Families and the Community?,” gives some reasons for schools to work especially hard to engage families, especially families living in poverty; highlights why relationship building is important; and offers some concrete strategies and practices to build trust between school, students, and families. 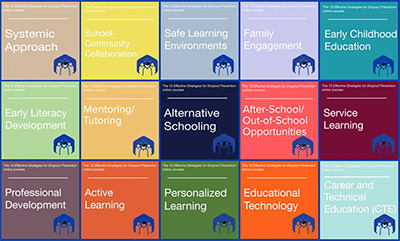 The National Dropout Prevention Center offers resources directly related to many of the strategies listed. Read about an educator, Trise Moore, honored nationally for her work in family engagement. Learn why she believes so strongly in the power of families working with schools to produce better outcomes for students. The article gives a nod to the fact that focusing on student engagement is often the first step before focusing on pure instruction. Schools and classrooms that value and work with families as teammates have a leg up as to what may motivate and engage individual students. Thanks to Dr. Joseph Goins for sharing with his networks a link to a recent article in The Atlantic, “Schools are Missing What Matters About Learning” (7/24/17, Kaufman). The article points to curiosity as being underemphasized across the board in today’s learning environments. Several additional resources are cited for more information on the topic, including Susan Engel’s book, The Hungry Mind. Good active learning strategies capitalize and build on students’ intellectual curiosity, thereby more actively engaging those learners for present and future learning. From a new report, Good Jobs that Pay Without a BA (Carnevale, Strohl, Cheah, and Ridley; from Georgetown University’s Center on Education and the Workforce, McCourt School of Public Policy, and JP Morgan Chase & Co.), “although the decline in the manufacturing economy eliminated many good jobs for high school graduates, there are still 30 million good jobs in the U.S. that pay well without a BA. These good jobs have median earnings of $55,000 and are changing from traditional blue-collar industries to skilled-services industries.” Figure 13 in the report illustrates that the number and share of jobs for high school dropouts has decreased since the early 90s; the number and share for high school graduates is still large but has decreased some; and the number and share for those with some college or associate’s degrees has grown. This is good news for high school graduates, but also indicates that being prepared for postsecondary education and training is a plus. Read the report here or link to the report, a video, and more information here. The Promise Neighborhoods program is a competitive grant program from the U.S. Department of Education’s Office of Innovation and Improvement (OII) that strives to significantly improve the educational and developmental outcomes of children and youth in our most distressed communities, and to transform those communities. See applicant information at https://innovation.ed.gov/what-we-do/parental-options/promise-neighborhoods-pn/applicant-info-and-eligibility/. Pre-application webinars are scheduled for Aug. 3 and 10 at 1 p.m. ET, as will be announced on the Promise Neighborhoods webpage https://innovation.ed.gov/what-we-do/parental-options/promise-neighborhoods-pn/. Deadline for intent to apply: 8/21/17.